Much like the original announcement of the Ipad, The announcement of the Apple Watch alerted people to the tech of having another smart device on their body. After Initial scorn, some research led me to plump for the Pebble Time, despite concerns over the compatibility, I’m now converted, despite only being a formal watch wearer in the past, however the Pebble is not for everyone. Coming with a soft 22mm silicone strap gives the standard Pebble Time a rather cheap toy-like look , that some people may prefer. Despite this the square bezel is brushed aluminium and the glass is your standard smart device glass. Both are of a higher quality than reviews had previously suggested. Simple black plastic buttons on the sides complete the device and don’t interfere with the design. For it to be a watch, rather than a sports tracking device, I had to change the strap. A simple ebay strap and 22mm spring bar purchase later and I had a brown leather zulu strap as pictured in the title. Now the look of the watch is definitely where I want it to be. Not obviously a smartwatch, but eye-catching enough to have someone ask about it. This is where we start getting into amazing territory. Why have lots of different watches, when you can have one that changes whenever you want? The Pebble time appstore has thousands of different watchfaces to download and install meaning you can change on the fly, whatever the occasion needs. If you are somewhere formal, you can download a classy analogue watchface. On the move a Casio type face with digital time is perfect. Like the applewatch a simple tinkering online with a generator tool allows you to put a photo on the front screen. It won’t be HD quality, but it will be simple and more than recognisable. The E-ink screen is similar to the technology on a Kindle and unlike the Applewatch is always on. You can flick your wrist to turn the backlight on and set the duration and brightness of this to your preference. 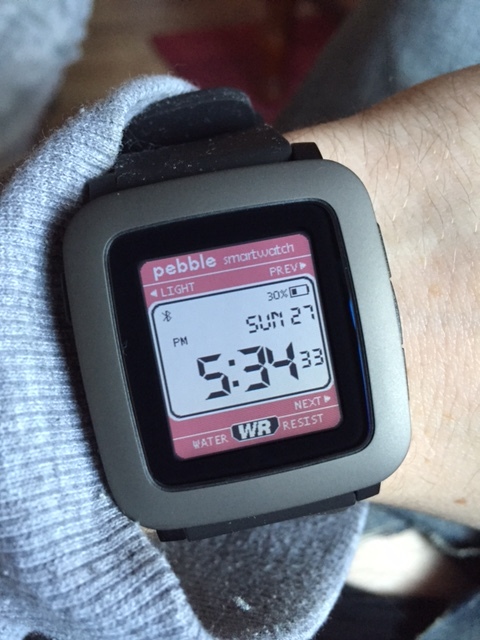 Advertised as being up to a week, the realistic life of the Pebble Time is around four days, with medium use. This is around four times the Applewatch and negates the need for everyday charging. My choice of strap makes charging slightly more awkward as I need to loosen the strap to fit the usb charger to the back, however this is personal choice of strap and nothing to do with the design. The sheer amount of tinkering you can do, to extend battery life is phenomenal and for a sad geek like me, becomes a meta game. By changing your watchface to the pictured Fuzzy Time International. you only need the screen to refresh once every five minutes. If you have a watch that shows seconds, it refreshes every second, eating into your battery. Background apps, that track movements, or battery drain it even more as does the number of notifications you receive. Dimming the backlight, reducing it’s time and downloading a detailed battery analytics app, all turn this into a slightly sad but entertaining distraction. Before everyone runs out and drops £160-£180 on his wonderful device take heed of the numerous issues I have experienced in tree weeks only. If you aren’t technically minded, then this watch is not for you. It can be a nightmare to pair via Bluetooth with your iphone. It connects via the Pebble App and then by two different kinds of Bluetooth, normal and LE or low energy. The problems I had in the beginning, were one of these dropping and the other staying connected. This led to an annoying, forget device on phone and reboot watch scenario, before it would pair again. Recent firmware and app updates seem to have helped, however this can still happen, especially if you pair your phone with another Bluetooth device at the same time, such as you car radio or home speakers. Some people would immediately return the watch if it didn’t pair first time. My advice is to keep trying as continual app and firmware updates are rolling out. It is not ideal, but it is an evolving ecosystem, so bugs should decrease in time. The pairing issue also has an effect on notifications. Sometimes they work fine for days, however an extended break from your phone, can lead to the watch not pairing when you return. I simply remember to keep them in the same room where possible. I have mine set for quiet time between 11pm and 7am, and every morning when I put it on I send a test notification from the app, if I don’t receive any emails or texts before this. A little niggle, but again something an early adopter of new tech is used to. Unfortunately the much vaunted timeline feature, is also a bit hit and miss at the moment, with few timeline ready apps working in the European timezone. Hopefully this will evolve with the watch itself. Unfortunately for Pebble, this exists. the applewatch is simply an extension of the iphone. It works as part of the phone, rather than a separate entity that communicates with it, as such the connectivity issues simply aren’t there. The applewatch also has the ability to respond to text messages and send those pretty drawings to other users. For me receiving a text message or email and dismissing the notification to deal with later, is all I wanted, others may want to use their watch for more, in which case they will need an applewatch at this stage, unless they have an android phone. You see, there is much more functionality for the Pebble time with an Android phone. You can voice reply to texts, and things just seem to work a lot smoother. Google’s pages and notifications are available as apps and the connectivity issues aren’t as pronounced. I am completely happy with my Pebble Time. The price and functionality, were all I needed in a smartwatch at this stage. Hopefully it continues to evolve and grow in compatibility with iphones. I would encourage people to know what they are getting into before shelling out for any smartwatch. If you have an iphone and can afford it, the applewatch is no doubt the best choice, however I don’t feel I am missing out with the Pebble Time. It does all I wanted it to do.